A couple years ago, we did an experiment to see what it would be like to live with very little toys. The kids were on board with it and after the end of several months, only asked for a couple items from the boxes. Life was so much nicer for all of us with so few toys! Getting rid of the toys is hard to do. We have been trained to believe that if we love our children, we will lavish them with material items. Grandparents are told it’s their right to spoil grandchildren, children learn from advertisements that it’s normal to expect the newest and be disappointed if family members don’t come through in those expectations. Unfortunately, the only ones benefitting from all these assumptions are the companies that sell the toys. The rest of us end up being overwhelmed- yes, even the children. Creativity is born out of limitations. Watch a young child play with cars… they will make noises for it, drive it, maybe it will even have a voice and talk to other cars. But, if the car has buttons and makes noises on it’s own, you’ll find that the child won’t make noises for it, and often, won’t play with it for very long before it gets lost in the toybox. You can see it when they play outside- if children find sticks, they may sword fight, or pretend they are canes, or umbrellas. They may pretend they are a family, animals, or rockets. It’s limitless! But if you give them a plastic sword… well, it’s likely to only ever be a sword. Sure, this all sounds good- but how do you actually get the kids on board with getting rid of things? Ask them to join you in an experiment. You can read about our getting-rid-of-the-toy-experiment here. Keep out the toys you know they enjoy, but keep a limited amount of them. Example: keep out 4 matchbox cars instead of all 45. Pack the rest up into boxes and set them aside. Determine how long you would like to store them for (Try at least 2 months). At the end of that time period, take note of the results. Talk to the kids about the experiment and listen to how they feel about it, what they liked, what they didn’t like, if they want any of the toys back in their room, etc. Limit the space given to toys. If you have bins, a toy box or a shelf, you can specify that all the toys need to be able to fit into that space, so it’s easier for the children to tidy up at the end of the day. 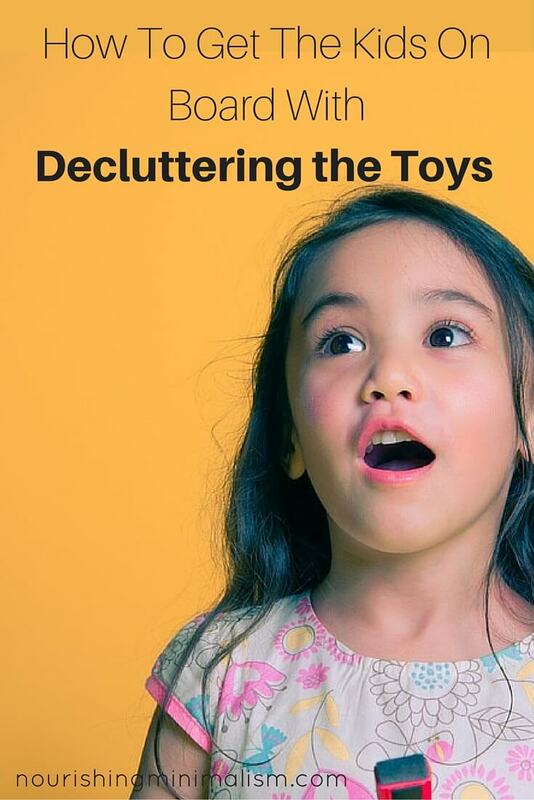 Pull out all the toys from everywhere, pile them into the center of the room, and have the children pull out only the things they love to put back into the toy area. If not everything will fit, then let them know that they will have to narrow it down some more, and decide which items bring them the most enjoyment. Limit the amount per child. For many years we limited the amount of belongings each child had. Like the above example, we would pile everything into the middle of the floor and each child would pick out what 20 items they would like to keep. This did not include sets like Lego and Duplo blocks. Each child had their own cubby to keep their treasures. Let them have their own special color on the yearly decluttering chart. Sometimes simple recognition is all the motivation that is needed. Plan out a special activity when you reach certain numbers- go to the park, out for ice cream, play a board game together, etc. Children often will happily trade toys for time with their parents. Click here for activity ideas that don’t require pretend play from parents. Talk to them about why we keep things. For my daughter, it made sense when she heard “We should only keep the things that we really love.” That one phrase changed her life. Before she didn’t want to get rid of anything and suddenly, she was looking at her collect differently! The key is this: when we look at what we want to get rid of, well, there isn’t that much, but when we look at what we actually love and want to keep– well, that number is considerably less. Pay them for the toys. 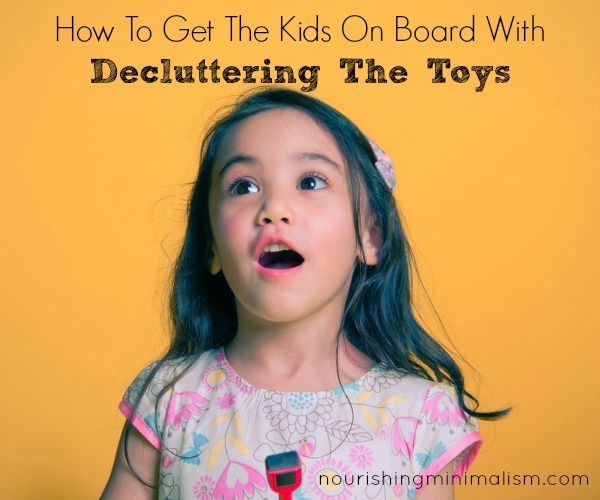 In the end, you do what you need to do to stop the overwhelm of too many toys. Choose carefully how you will pay: $0.01 per toy, $0.05 per toy, $5. per box, etc. Choose what works for your child. Some children will count every marble and scrap of paper, and if you’re paying $0.25 each, that is going to add up fast! After we completed our toy-experiment, both kids wanted scooters. I made them a deal: I would get rid of those packed boxes in the garage, and they would get new scooters. It was a win/win in my book. Never guilt or shame a child into keeping something. We have many special people in our lives, but just because a special person gave us something, doesn’t mean we have to keep it when we don’t like it or don’t use it. Most adults struggle with these emotions when we are in the same situation, use this as an opportunity to teach your children that it’s perfectly okay to let things go, regardless of how we acquired them. Getting rid of an item doesn’t mean we love people less, or that we will forget about them. Don’t get rid of things without their permission. (Unless they are very young.) When we toss things without asking and then they realize it later, they will learn to hide things away and begin to worry about their material items when they are gone. These are not healthy habits. Instead, use decluttering as an opportunity to teach them appropriate actions towards items. If we don’t need it, we give it to someone who does. If we love it, then we need to display it or use it (not keep it boxed and hidden away). Even toddlers can understand when it’s time to let things go. Let them help you and celebrate their work. Be sure to involve the children by talking with them and including them in the process. Decluttering with our children is giving the next generation tools they need, so they don’t have to have the overwhelm of excess that many of us have had to face. Love this & it’s perfect timing for our family. We’ve been discussing how to approach the accumulation of toys. We’d hoped that asking extended family to gift consumables would help alleviate the clutter the past couple years. While it’s helped, the toys still seem to multiply. We go through several times a year to gather donations for various causes, which really makes the kids feel great about letting go. Great article! I have to admit though I do get rid of some things I know they won’t miss without permission. We’ve been doing something similar for a while. My kids chose what they wanted to keep and what they wanted to donate/bin. After this I split what they wanted to keep in 2 and half went to our ‘toy library’. The toy library opens on weekends and they have to swap out a toy to get something back. It’s been working really well and so far there has been no complaints.